Nothing is more satisfying than having your husband cook up a meal on a lazy Saturday evening. But to present something so beautiful and delicious as the paella is pretty darn special. I mean look at it. Looks labor intensive right? Well, according to my husband, as long as you’ve got the right ingredients and the right pan and a lot of love for this Spanish dish than it’s not that difficult. He doesn’t follow one particular recipe. He’s made it many times and each one was a little different. I must say, the addition of seafood is what did it for me. F A N T A S T I C.
Saturday’s paella had all six of us loading our plates. All but a few pieces of sausages were devoured and a couple of spoonfuls of rice. We are eternally grateful to you oh Paella Master! I like what Norberto Jorge has to say about paella. He gives a nice run down of what it takes to make a good paella. Like I said, my husband doesn’t have one paella recipe written down. So I must refer you elsewhere. This site, Spain Recipes, seemed to have some authentic good ones. Good luck! The dining room table was well prepared for this feast. The cozy breakfast nook was no place for the debauchery that unfolded this Labor Day weekend. Mother laid out the disposable tablecloth as I stockpiled the heavy duty napkins, pre-moistened for added cleaning power. Sister took inventory of all necessary supplies i.e. nutcrackers, picks, vinegar dip, and rice. Even my youngest made sure all drinks were at hand within reasonable grasp. 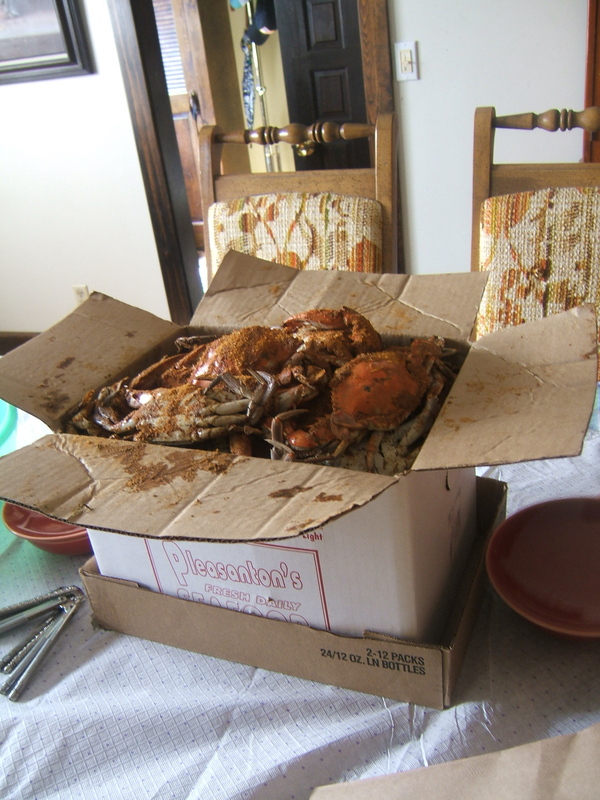 The towering bushel of crabs, haphazardly packed in a white cardboard box, was beautifully seasoned and placed as the one and only centerpiece, rightfully so. Extra chairs were set in place to accommodate all. 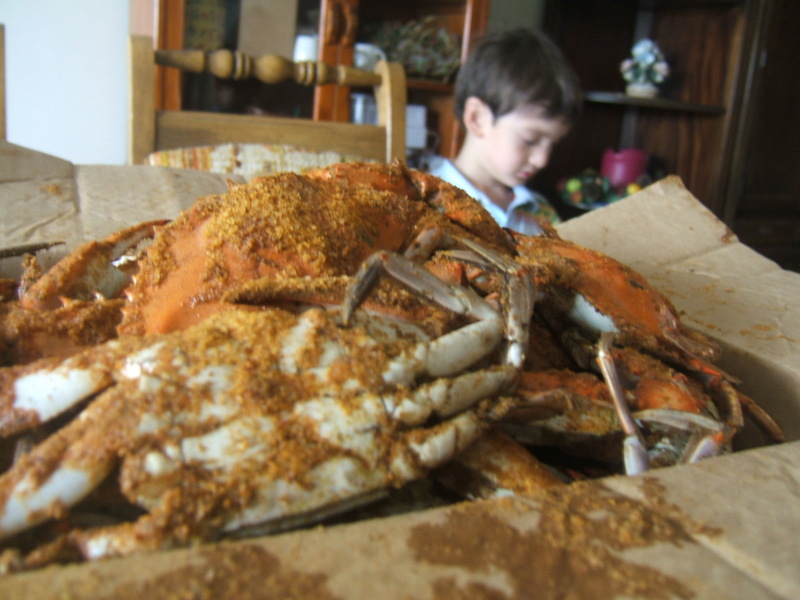 Even my husband who didn’t plan on eating any, partook in the jovial camaraderie associated with crab eating, and ate one or two of his own. Do you eat as you go, or do you accumulate like me. In other words, I like to shell as many crabs as I can, piling high on my plate a mountain of crab meat then rewarding myself with spoonfuls of crab and rice. Yummy. 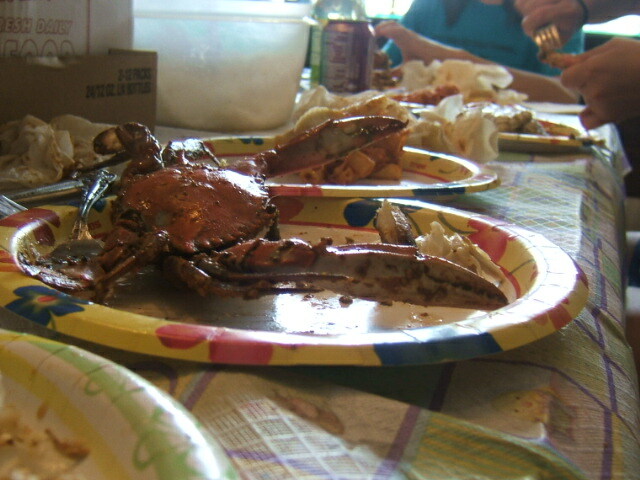 This crab fest is a once a year event for us. So we make sure we enjoy it. It was the perfect way to close the summer season at mom’s house. There was other food to enjoy as well: potato salad, roast beef, baked ziti, fries, chicken tenders (the kid must have), chocolate cream pie, watermelon, and jersey sweet corn. Thanks mom and dad for making your home a constant source of fun and food for all of us and, as always, making this summer something to remember. Summer is almost over and the kids are revving up for another busy school year. We’ve had our fill of pool water, SPF 70, spying on baby bunnies and birdies, marshmallow roasts and sweet New Jersey corn. It’s time to get serious. Right? Let’s not forget there is one weekend left, one last hurrah to be spent before we stow away our summer dresses and sandy Sanoks. So keep those flip flops on girls and boys, we’re heading back to Lola’s and Lolo’s house to celebrate Labor Day, a holiday that gives most of us that extra day off. A holiday that is the culmination of all things summer and sweat, joy and exasperation, beer and barbecue. Girls, we will badminton till the sun goes down. And Emil, we will let you splash us to your hearts content because in our sunny exaltation we just won’t give a ….care. All of us will enjoy the hearty Lola breakfast that brings all of us together at that cramped yet cozy breakfast bar. Homemade waffles or pancakes with whipped cream, strawberries and blueberries, sausages, and, crescendo please, that creamy chocolate delight we call champurado ! It is every kid’s dream to have this oogey, gooey chocolate dish for breakfast. Better get up early or you’re likely to be scrapping the bottom of the bowl for an ounce of this stuff. For those that don’t know, champurado is a traditional Filipino breakfast treat that is usually eaten with something salty, ie salted fish or what we call tuyo. My kids pass on the fish part and blast spoonfuls of pure chocolate bliss into their mouths. Don’t worry all you healthnuts, this is a treat that can only be enjoyed at Lola’s house as I have tried and failed to replicate her recipe to the exact gooeyness. And why is that…no matter how precise I am in following any of her recipes, it never turns out the same? Lola’s and Lolo’s is a place where we can all be kids. It’s a place where we can relax, get in each other’s business, laugh and relax again. That is why we love going there. This summer it has been every other weekend or so and it will certainly dwindle down as school begins. So kids, are you ready to go to Lola’s house? Click on photo for a link to RecipeZaar’s Champurado recipe.